Growth of the student body at the Pennsylvania College of Health Sciences has gone from a single nursing program of 40 students nearly 100 years ago, to an enrollment of 1,700 students with 14 health science and nursing programs. With the continued growth and an expected increase by 2,000 students over the next several years, a new campus had been on the horizon for quite some time. When Scott Lokey, facilities director for the College, created his wish list for the new campus buildings, number one the list was to eliminate the more than 3,000 different keys he had to manage for all of the openings he monitored in six different locations on campus. To further complicate matters, the electronic access control would have to have a photo ID credential that would allow student access to the three completely different areas: 1) security access to specific areas, 2) point of sale access (meal plan purchases), and 3) health record access during clinical assignments at Lancaster General Hospital. In addition, the credential had to utilize an 11-digit ID number because the security system currently in place was based on the 11-digit formula. Lokey was pleased to learn that American Direct, along with their access control solution AccessNsite, could supply not only the doors and hardware for the more than 600 openings, but could meet all requirements for access control. American Direct is the only company in the nation wholly able to design, source, install, monitor, and maintain every facet of a building’s openings — from the mechanical and electronic components of the actual door structure to the software and hardware that manages and uses the flow of data. Combining Division 8 and Division 28 product, service, and expertise to provide totally integrated safety and security solutions made American Direct the obvious choice for this project. 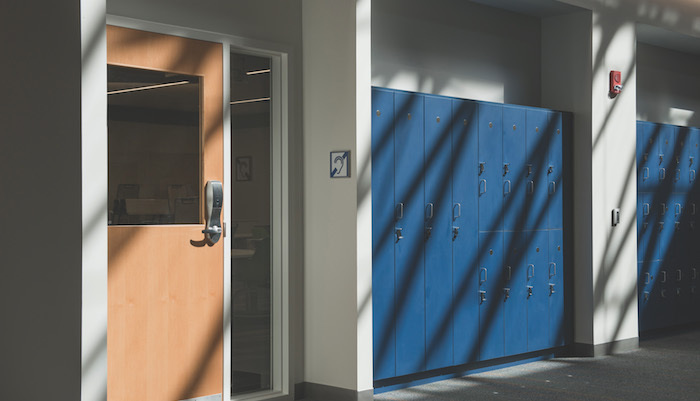 With AccessNsite, Lokey and his team at PA College could count on one partner to provide both the electronics and the intelligence that determines who has access into buildings and when. With the system, access is simply added (or removed) to the credential holder as needed, getting rid of the hassle of rekeying every time a resident moves in or out. Another plus is the security history created in the software when someone accesses an opening, making this an integral component to the campus security plan. Even better, if there is an issue with an opening, contractors typically have to work with three different companies to figure out the problem. But now, with American Direct and AccessNsite, all three components are provided by a single source who has a complete understanding of the opening and can solve any issues on the spot. In addition to the doors, hardware, and access control solution, American Direct’s Fulfillment Center in Mountville, PA (just 20 minutes from the job site) provided a staging area for the product until it was ready to be installed. The fulfillment center also provides on-demand service to handle any troubleshooting issues after installation. Jim Saltzgiver, American Direct’s northeast manager, has a service team of six individuals able to resolve issues at PA College. “Once in awhile a door is delivered improperly prepped, or a hinge doesn’t match up with a frame, in which case we can have a professional out very quickly and get it taken care of with no additional cost to the owner,” says Saltzgiver. With this project, the manufacturer had to install some temporary lock sets and then later, the crew from the fulfillment center came out and swapped out the temporary lock sets for the permanent ones. It was a seamless transition possible because the Fulfillment Center is nearby and provides a team of professionals who can go out on the fly and resolve issues quickly. The scale and requirements of the PA College project provided opportunity for American Direct to successfully execute its suite of products and services; including pre-construction services, logistics, installation and field service, and access control. As demonstrated by this project, using American Direct’s totally integrated 8/28 security solution for every components of the door opening, saves time, money, and stress for all partners on a project.